i am curios to see your dektops here . Last edited by mpu on Wed Aug 28, 2013 1:25 pm, edited 3 times in total. Post subject: Re: Show your desktop using Classic Shell! This desktop also featured rainmeter, and rocket dock, Note: the reserved space on both sides of the screen prevents maximized apps from covering them, also the dock on the far left, is set to pop up on scroll over. My desktop look keeps changing frequently as I get bored of the same look. Wow. You all have some pretty interesting desktops. mpu, I like the icons in the second column of your menu. Just finished playing around and will try this simple double icon menu for awhile, on my Win 8. All my links to apps on left. All files and computer links on right column. I have icons memorized, so I cut out the text, with the "&" replacement. 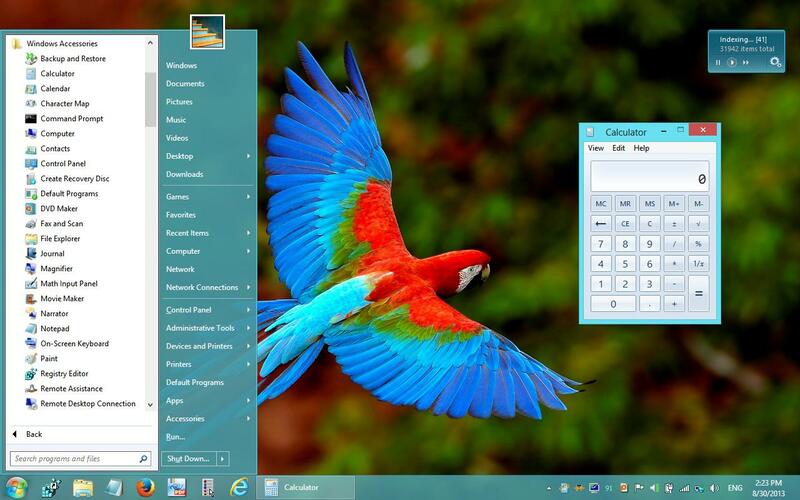 If I'm still using it after a week, I will replace with those Win8 tile icons too. so no point showing whole desktop. Man O man, Ivaylo sure puts a lot of settings in his program. Could tweak till the cows come home, and then some. Played with Win 8 icons from dakirby. Used "MS paint" to change colours and "Quick Any2Ico" to make icons. but then the menu looked like the Win 8 "vomit" start screen. Giving up for now, no time. I'll go back back to original 3d icons, less cartoony. How is it possible to let the text disappear?? I guess there are multiple ways of removing text and just leaving the icons. Here is one way, maybe the wrong way, but it works. Last edited by juniper7 on Sun Sep 08, 2013 1:20 pm, edited 1 time in total. How did you make both columns with same skin colour? Is it custom or preset? I can not make square menu corners, like yours. Metro Glass Skin, ok thanks. Switched a few things around. Heres my desktop. Here is my new desktop setup. 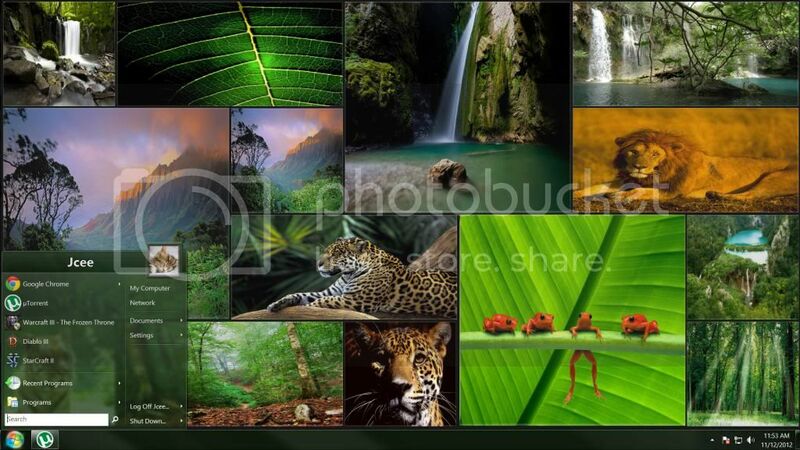 Theme Files include a complete list of Windows 7 themes in both rounded and non-rounded versions. 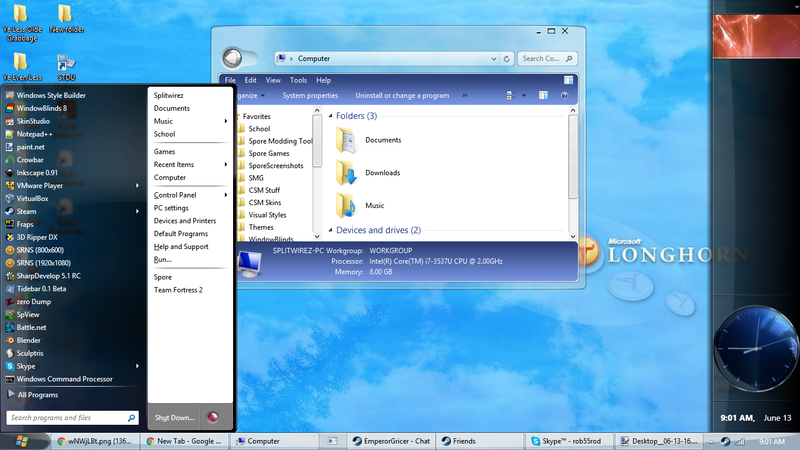 Start menu has the ability to be set to multiple transparency levels via a slider-like thing. In order to get the transparency to work with the window borders, it currently requires aero glass configurator due to the fact that Aero Glass by BigMuscle doesn't work with custom themes unless the selection that allows for clear class windows is unchecked (due to a glitch caused in custom themes when it is checked). Hopefully you guys can create a skin for Classic Shell that will look like the one in my photos. All in all, I'd love to have this working in Classic Shell so that I won't need StartIsBack. 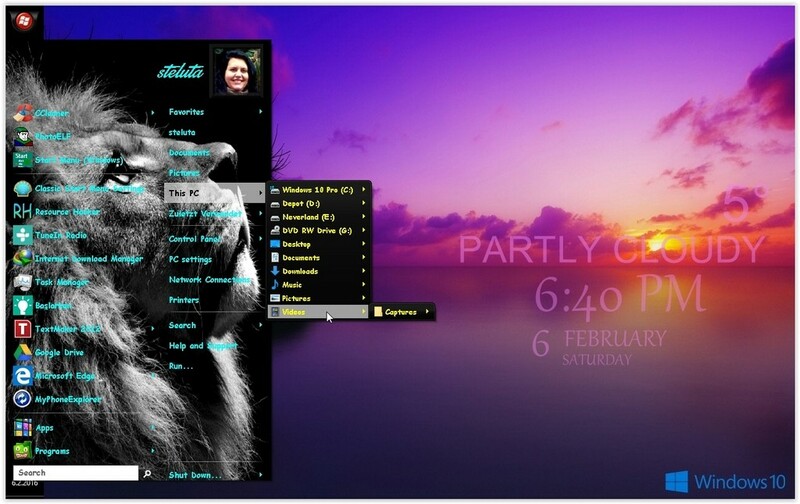 Hello, I have decided to apply a new theme since my last one took so much resources that it slowed my comp down bad. Here is my new theme. To obtain the images for RocketDock, I simply used the add feature to add the folders I have on mine after applying the icon images for the HUD Evolution theme to my computer. I am not sure if this theme will work with Classic Shell, but I will look for the start menu .skin file and see if it does. If so, I will update this post to let you all know. The custom skin for this theme wasn't in it. It shows up in the settings area as the 'Default Skin' but it doesn't show up in the actual folder. Accidentally forgot to install the custom font that came with this theme. Got it installed now and have replaced the screenshots with new ones. Hello, I've stopped using StartIsBack Plus and have returned to Classic Shell since I personally like it better. Here is my new theme setup. Modern Mix to be able to open metro apps in windowed mode. Looks nice.. I've never strayed from the default Icon Sets myself because its just to much hassle, and theres always some that just don't fit. Didn't actually get to test the CS skin with aero glass myself, and id say it did turn out more transparent than I expected (in a good way). Your taskbar Icons are centered; are you using some kind of dock to accomplish this? or a a reg tweak? Thanks. I just use an empty quick launch bar and an empty links bar to center my task bar images. It's a useful little work-around lol. Ah, I guess that 'works' but then anything else you open wont be centered then will it? yup, they open centered because the empty quick launch bar and empty links bar push all icons into the center. Quick Launch bar on left, Links bar on right. In fact, if you look at the task bar in the first screenshot, you'll notice that the icon for the folder open in it has been pushed to the center by the empty Links bar, instead of appearing on the other side of it. on that subject however, I am looking into finding a reg hack [or whatever it's called] of which will automatically center my task bar icons so as to not need the Quick Launch bar and Links bar to simply make it seem centered, lolz. I'll post it here if I find it. Just remember, I'm running Windows 8.1.1 on my computer so even if I do find one it might not work for everyone here. hehe.. lookie lookie, aero glass configurater makes the start menu skin even more transparent. Me likey =3. I'm also in a goofy mood today lolz. UxStyles used in place of UltraUxThemePatcher to enable third party themes. Got a few slight edits to my theme. A updated version of the start menu skin made by Jcee [Can't thank him enough for all his hard work on the start menu skins]. A new skin for WMP since it didn't have one for it [basically managed to get hold of one that matches the theme]. And am planning to get a matching skin for the task manager as well [it doesn't have one atm, so it's not in the screenshot]. really got that classic look nailed down; what OS are you even running? The start button logo is from display.dll. I wonder whether there is a white logo somewhere. A huge fan of DJI quadcopters. Here's my review of the DJI Mavic Pro vs Spark. The first one I consider the best consumer drone ever. Last edited by regions on Thu Aug 09, 2018 5:45 am, edited 1 time in total. I'll take drastic measures to save space, lol. Post subject: My steam start menu. I should do the same for my games. It saves time thanks for an idea!